We all know fish is brain food. So smarten up your whole family with this delicious recipe. Make your own healthier version of fish cakes by adding a good quantity of vegetables. Mix all the ingredients except the oil in a large mixing bowl. Divide the mixture in equal parts and form small cakes. Place a piece of wax paper on a tray and place the cakes on it. Leave in the fridge for 30 minutes. Heat the oil in a pan. (Use a brush or piece of kitchen paper to grease the base of the pan only.) Fry the tuna cakes for 10-15 minutes on both sides until cooked and crisp. 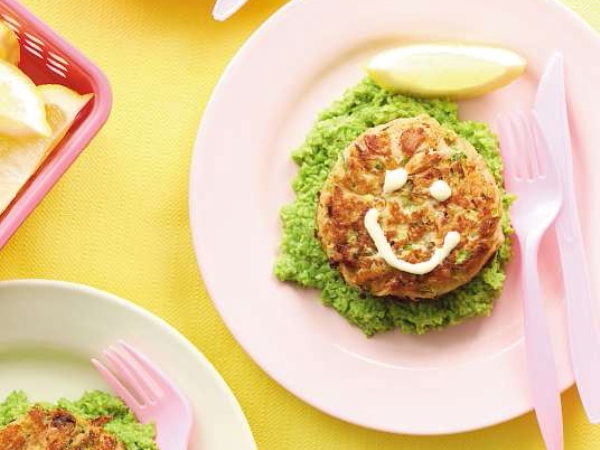 Decorate the cakes with mayonnaise faces and serve with mashed peas and extra lemon wedges. Steam the peas for about a minute and stir in the yoghurt, olive oil, lemon juice and nutmeg. Mash the mixture with a fork and set aside.